Take a trip back in time to when life is simpler in this community of neo-traditional style homes in Harris Village. Cozy front porches and kid-friendly sidewalks for playing and riding bikes gives this community a neighborhood feel. 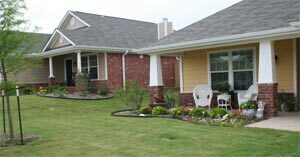 This subdivision was specifically designed to bring back friendship and a sense of community among neighbors. Harris Village is an exclusive development to Hart & Associates Builders and all of the homes built in this community come in a complete package. Starting at 1,650 square feet, these homes range in price from the low $200s with both three and four bedroom plans available. All home packages include full landscaping, a privacy fence, sprinkler system, security system and are pre-wired for a computer. Each home also features hardwood custom cabinetry, tile floors in the bathrooms, a fireplace in the living area, covered front and back porches, plus a two-car garage. This community has a convenient location, while still providing the advantages of a quiet neighborhood. "With quick access to I-35 and being only two miles from the new Hillcrest Hospital, this subdivision has a great location in Robinson ISD," Gary Hart builder and developer for the community. 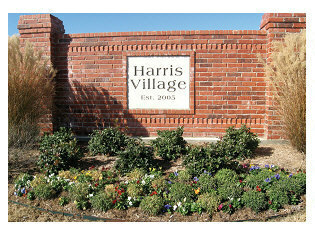 For more information on this community, visit www.harrisvillagesub.com or call 254-722-1776 or 254-722-1100. The Harris Village model home is located at 709 Heston Circle is open weekdays and on Sundays from 1 to 5 p.m. Location - I-35 South, Exit 328, turn right past Kenworth Trucks, 1 mile east on Grieg Road. For as long as he can remember, Waco builder/developer Gary Hart has been involved in some form of construction. His first experiences with building were working alongside his grandfathers on various carpentry projects in and around Italy, Texas. As a teenager, Hart found part-time work helping with a variety of tasks on homebuilding jobsites and, in the early 1970s, he apprenticed with some of the city’s most notable and respected builders. In 1977, he founded Hart & Associates Builders. 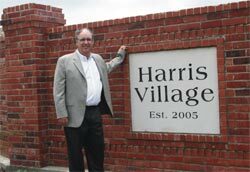 Today, Hart is developing the Harris Village subdivision in Robinson and also the Bethany View Estates subdivision in Lorena. He is a member of the National Association of Home Builders (NAHB), the Texas Association of Builders (TAB), and the Heart of Texas Builders Association. 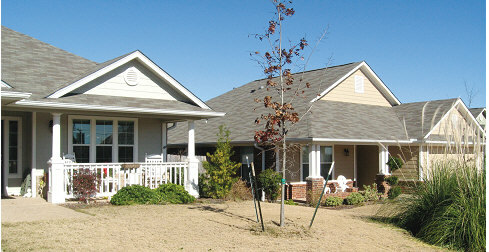 Harris Village is located on Greig Road and features three and four bedroom homes from 1,650 to 1,780 square-feet. This community is specifically designed to facilitate and encourage the traditional social interaction between residents. Hart’s wife, Jane, insisted on putting sidewalks throughout the subdivision to provide a safe place for kids to ride and adults to stroll alongside. 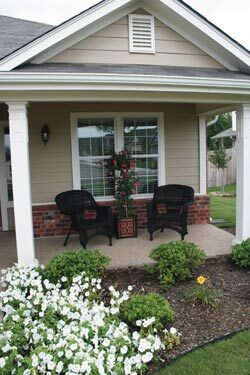 The roomy front porches of these neo-traditional styled homes are the perfect place to sit and relax at the day’s end. The third phase of Harris Village is expected to start in summer of 2012, Hart said. There are a total of 160 lots in the subdivision. With their relaxed bungalow feeling, these homes bring back good memories. "The Griffis Floor plan here is named after the next door neighbor who used to baby-sit for some of us when I was little," Hart said. "I remember how much fun it was to sit on her front porch swing and watch the neighborhood activities." Eventually, covered and landscaped picnics areas will be added to the development, as well. “So far, Harris Village has been equally attractive to young couples, homeowners that are downsizing, and retirees,” Hart said. The Harris Village model home at 709 Heston Circle is open weekdays and on Sundays from 1 to 5 p.m.
Lorena’s Bethany View Estates is located on Northern Star Road and offers ranch-style, brick homes of approximately 1,800-square-feet priced from the $150s. Lot sizes here range from one-half to three-quarter acre with a total of 71 lots in the development. The third phase of Bethany View Estates is expected to begin in the spring of 2008. Both longtime residents of Waco, both Gary and Jane Hart are familiar to lots of Wacoans from the many years they owned and operated Parkdale Cleaners in the Parkdale Shopping Center at the corner of Bosque and Valley Mills Drive. In 2004, Hart & Associates Builders entered the Fredericksburg, Texas market and scored another success with the creation of Ada’s Peach Street Hideaway Guesthouse just three blocks off Main Street. Featuring three bedrooms and three full baths, this popular Bed and Breakfast is a favorite destination for those attending the different festivals and events in the Hill Country. During the peak travel seasons, advance booking is a must. The Guesthouse is available as a small romantic getaway for two or a larger group of up to eight. Interiors are the work of noted Fredericksburg design consultant Barbara White, whose work has been featured in national interior decor magazines. With its rustic exterior and turn of the century furnishings, Ada’s Peach Street Hideaway Guesthouse combines the romance of a bygone era with the modern conveniences and luxurious fabrics, fine designer linens and toiletries. The Hideaway Guesthouse has kitchenettes, a double Jacuzzi in each bath, a fireplace, wood-burning stove and a private entrance to each suite. With 36 years experience in the building industry, Gary Hart plans to continue the career he is passionate about. Hart & Associates Builders is dedicated to providing fine homes in well-planned developments for those who choose to make Greater Waco their home both now and in the future.